Houston Texans defensive coordinator Wade Phillips watches from the sideline during the third quarter against the Oakland Raiders at Reliant Stadium. The Raiders defeated the Texans 28-23. 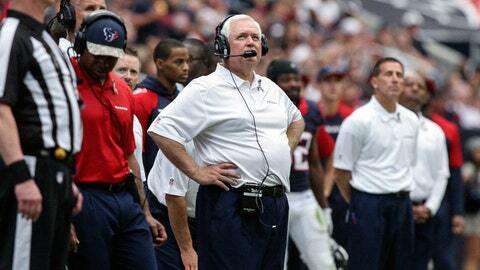 Wade Phillips talked about how certain young quarterbacks have to hit rock bottom before they can turn things around. Case Keenum and the Houston Texans are certainly at that point. Keenum had his worst outing in eight games as a starter and the Texans dropped their 12th straight on Sunday in the first game with Phillips in charge after coach Gary Kubiak was fired Dec. 6. Now Phillips is looking for ways to help Keenum improve with Sunday’s game against longtime Houston nemesis Peyton Manning and the Broncos looming. "I’ve seen it happen," Phillips said Monday of quarterbacks bouncing back after struggling early in their careers. "Some of them don’t bounce back up and aren’t good enough and don’t end up good quarterbacks. But this is a rough time he’s going through and we’ll see what he does." Keenum is dealing with a sprained right thumb. The Texans aren’t sure how serious the injury is, but Phillips said he is concerned about it. Keenum is in his first season playing in the NFL after spending all of last season on the practice squad. In Sunday’s loss to the Colts, he threw for 168 yards with two interceptions and no touchdowns. He was sacked four times, one of which resulted in a fumble and safety, and was hurried and hit numerous other times. "He saw the blitzes when they were coming," Phillips said. "But seeing blitzes and getting rid of the football is different than just seeing them. That and reading coverages is not an easy process, and especially for a young quarterback to know exactly where to go with it." Phillips said the Texans will work this week to identify what was happening early in the Keenum’s tenure as starter when he was playing better. Phillips also said he spoke to the offense about doing more to help Keenum while he develops. "He’s going through a process," Andre Johnson. "He can’t take all the blame. We’ve all played a part in it. We all want to be perfect, but at the same time we’re human and you’re not going to go out and play perfect games all the time. But … as a team we have to find a way to win." Despite his struggles, the Texans remain committed to seeing what Keenum can do this season and Phillips said he will start the final two games. Houston must win one of its last two contests to avoid matching its franchise-worst record of 2-14 from 2005. One thing that could help Keenum and the Texans fare better is eliminating penalties. Houston had 14 penalties Sunday, tying the franchise record it set a week ago. Phillips brought in officials to throw flags at practice last week, but it didn’t help the Texans clean up their play. "Unfortunately some of the penalties we had in practice carried over to the game," Phillips said. "If they had a penalty in practice, we took them out of the practice and sat them on the side — kind of a time out. Something to embarrass them a little bit, and we’re going to continue to do that. We’ve got to cut down on penalties." Houston also is dealing with several key injuries in addition to Keenum’s thumb. Running back Ben Tate, who broke four ribs in late October, took another blow Sunday and is having tests to see if there is further damage. Also injured were defensive end Antonio Smith, who has a sprained knee, and cornerback Johnathan Joseph, who has a groin injury. Phillips wasn’t sure Monday if the injuries would keep the two out against Denver. The Texans are second in the NFL in yards passing allowed a game, but the unit would take a major hit if top cornerback Joseph can’t play Sunday. Houston is well acquainted with Manning after he dominated them for years while he was with the Colts. "He’s having a tremendous year, one of the greatest years ever," Phillips said of Manning. "It’s going to be a big challenge for us. We’re going to have to step up our defensive play, especially our pass defense."